Daron’s Guitar Chronicles tells the story of our protagonist from about the time he is 19 onward. He arrives at RIMCon (Rhode Island Musical Conservatory) in the mid-1980s, desperate to leave behind a dysfunctional family in New Jersey’s suburbs and discover himself. It’s the advent of MTV, AIDS, and punk versus metal, all of which would affect his journey searching for fame, artistic expression, and the courage to be who he wants to be. Imagine being in the closet in the era before Ellen, before Queer Eye, before cell phones, before the Internet. Updates every Monday, Wednesday, Friday until it’s finished. Daron's Guitar Chronicles has not been tagged yet. 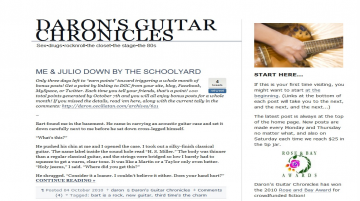 Help others find Daron's Guitar Chronicles by tagging it! Daron's Guitar Chronicles has not been reviewed yet. Daron's Guitar Chronicles has not been recommended yet.